We've still got stormy weather around here after the big storm last night, and an apparently even worse one is on its way to keep us on our toes. There was quite a lot of damage caused by falling trees and roof tiles, but at least up till now nobody has been badly hurt, so hope it stays that way. At Try it on Tuesday a new challenge is starting - they who have wings. 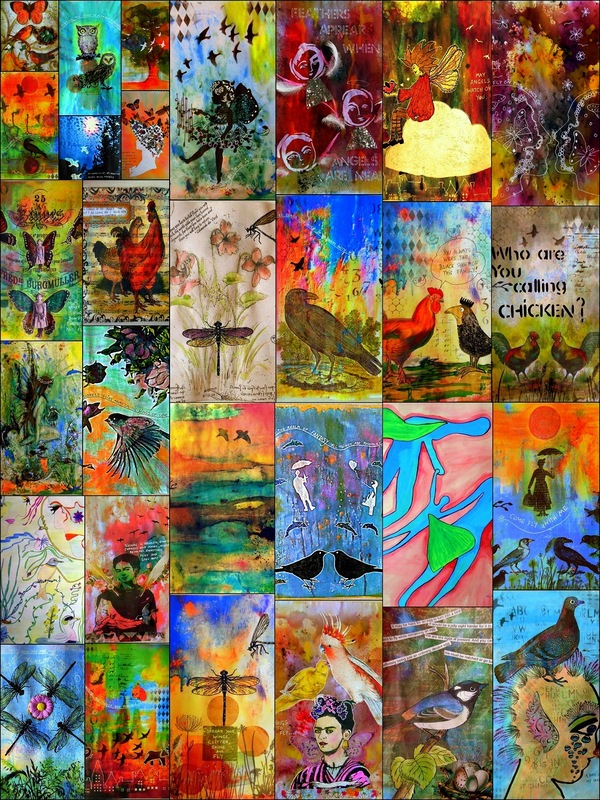 For me it's a seamless continuation of the challenge 'Things with wings' at Art Journal Journey, which ends today. Huge thanks to my dear friend Chrissie, our hostess at AJJ this month, who really was a 'hostess with the mostest' this month! There will be a new challenge tomorrow, so please come back and see what it is. But back to Try it on Tuesday. The challenge there runs for 2 weeks, and all sorts of projects are allowed, so hope to see you all there! My journal page is a mop-up page sprinkled with a pinch of Brushos. Frida is an image from Seth Apter. Her wings are vintage German scraps, and I drew the little birds with black ink. The quote is from Frida Kahlo. To celebrate the last day of Things with wings at Art Journal Journey I have made a collage of all of my projects from the month. And last but not least, at Tag Tuesday our theme this week is 'Easter Bonnets'. I don't know if the lady in this image (from Gecko Galz) only wears her hat for Easter, but she looks good anyway. I added the trellised shutters, some coordinating pearls, some feathers and a rose to her hat and liquid pearls to her necklace. The sun has been trying to show itself all day, but the clouds often won. It was very windy, so the cloud formations changed continually. and thanks a lot for coming by! Today was a Sunday with no sun, but loads of rain and wind. In the evening it got really stormy, and we were treated to thunder and lightning, hailstones and extra torrents of rain. For Art Journal Journey, things with wings, I have another journal page to share. The challenge for this month has been a bumper one, and you still have 2 days to join in! On Wednesday there will be a new theme, so watch this spot to see what it is! Used a painted background and used lots of stencils from CWS, Dina Wakley, unknown and Home-made. The elephants are dancing through the air with the birds, an owl is soaring about and the people in their houses are probably watching TV....or dreaming - in dreams all things are possible. For those of you who love animals, especially dogs, this video is really heart warming - man's best friend indeed! Today started off with a wonderful sunrise, but the sun was driven away by black clouds, wind and rain after a couple of hours. And Sunday is going to be worse. Ah well, bad weather is always good for a pyjama day spent crafting and reading. For Art Journal Journey, things with wings, and Mix it Monthly, angels and saints, I have made another journal page. The background was another mop up/brush wipe page on which I used a couple of background stamps to give some texture. The glitter angel with her cloud has been painted separately, fussy cut and glued onto the background. The houses along the bottom have been drawn with a stencil. Just a quick post this evening, time has run away again. For Art Journal Journey and for Moo Mania and More I have made another journal page. I used various images, coloured with Gelatos and Stickles. The nest has been made again from some plant stems and seed pods, and the eggs have been cut out and fixed on with foam squares. The sun tried to come through the clouds this morning, and stayed with us for a few minutes before disappearing behind the clouds which got steadily greyer. Another week has flown by, and it's Friday again. This has been a sad week here with the dreadful plane crash, and it is awful to think how many lives have been adversely affected by it. The plane should have landed here at the airport which I can see from my windows. My heart goes out to all those who came to pick up their loved ones, and will never be able to see them again. For Art Journal Journey, things with wings, and Paint Party Friday I have made a little semi-abstract piece, rather smaller than usual, as it was just a piece of waste paper, 21x19cms. I used it to mop up colour from a larger piece I made, and when I looked at it, it reminded me of sunset over the Rhine meadows when they were flooded. I added more colours with Gelatos, a few strokes with a charcoal pencil, and some Dina Wakley birds. This morning started out cold and wet, with the sun struggling to break through the clouds. On my walk I looked for signs of spring, even if it doesn't feel like spring just now. This chappie over one of the shop doorways was looking, too. Owls, a tag and a ferry. I want to write a blog about the *normal* happenings of everyday life that weave the fabric of Life's Big Scrapbook. I don't like copying other people's styles, I want to do my own thing. I will do a thing as long as I like it, or it does me good, and then leave it when I realise that it's time to move on. Don't want to follow other people's rules, which doesn't mean that I don't like or admire the work of others. But I want to be the first ME and not the second anybody else.